Many people enjoy spending time in the sun, but it can also cause harm. The sun can cause skin cancer, sunburn, wrinkling, and skin aging. Too much sun can even harm the body’s immune system. You don’t need to get a sunburn to have skin damage. Skin damage builds up over your lifetime. So protect yourself and family from the harmful sun rays known to cause skin cancer. According to the FDA Center for Health, the sun’s ultraviolet (UV) rays cause sunburn. The sun gives out two kinds of UV rays. They are called UVA and UVB. You need to protect your skin from both UVA and UVB rays. Look for sunscreens and sunglasses that protect from both UVA and UVB rays. Use a sun protection factor (SPF) of 15 or more. Limit your time in the sun. Apply more sunscreen every two hours and after swimming, sweating, or towel drying. Use sunscreen even on a cloudy day. Glare from water and snow can expose you to UV. Wear clothing that covers your body. Wear a hat with a wide brim to protect your head and face. Wear sunglasses that protect from UV. Not all tinted and dark glasses offer UV protection. Check the label before you buy them. Avoid the sun in the middle of the day. The sun’s rays are strongest from 10 a.m. to 4 p.m. in spring and summer. Avoid long periods in the sun. 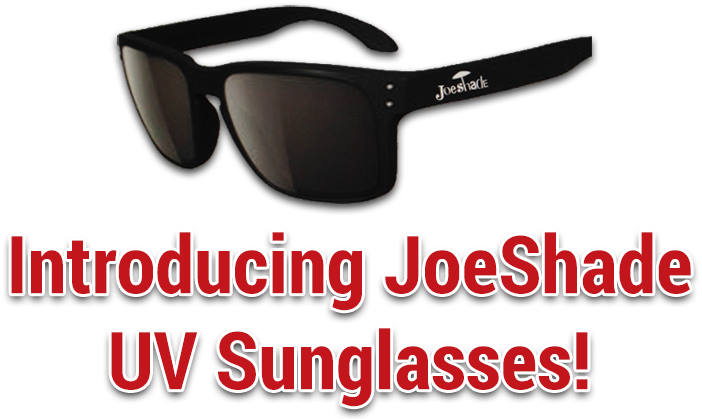 A great solution to keep you protected and shaded is JoeShade, UV umbrella. JoeShade is a lightweight portable shade umbrella that you can take anywhere. What are “sunless” tanning products? Sunless tanning products are cosmetics that make the skin look tanned. Most of these products don’t have sunscreen, so they do not protect your skin. You still need to use sunscreen. Sunless tanners and bronzers can make you look tan without the sun. If you do not apply them carefully, they can leave streaks. If you go to a spray-on sunless tanning booth ask for protection to keep from breathing in the spray. Keep it out of your mouth, eyes, and lips. FDA has not approved any tanning pills. Tanning pills can have bad side effects. These may include nausea, cramping, diarrhea, severe itching, and welts. Tanning pills also may cause yellow patches inside your eyes. They can affect your eyesight. Some lotions and pills claim to make you tan faster. There is no proof that these work. “Tanning accelerators” are not approved by the FDA. So be sure to play it safe in the sun! Keep applying your sunscreen and have fun!